Base size is for standard sized doors up to 36" x 84"
The PDS Heavy is an adjustable door stop for heavy doors meant to install directly to the door jamb and serve as the door's only stop. When the door is closed, it will rest against the rubber creating a heavy door seal around the perimeter of the door slab. The rubber can be adjusted by tightening or loosening the pan head screws on the opposite side of the rubber. The easy to compress rubber allows the door to shut with a low closing force while fully sealing the sides and top of the door. The performance of the PDS Heavy Duty Rubber Door Stop is equal to the PDS Light Door Seal in most frequencies with slight improvement in the lower frequencies. The main advantage of the PDS Heavy adjustable door stop is the ability to adjust how far the rubber extends to seal against doors, especially uneven doors, as well as installation without existing stops. We recommend combining a set of PDS Heavy Duty Rubber Door Stops with a set of PDS Rubber to create a dead air space between the two rubber seals. Doing so will maximize the performance of the seal system to a near zero loss perimeter seal performance. Each PDS Heavy ships with the required fasteners along with full installation instructions from the manufacturer. A brief description of the installation can be found below. The PDS Heavy is designed to install directly to the door jamb. The included fasteners screw to the side of the PDS Heavy into countersunk holes. Before installing, make sure the rubber is extended about 1/8” consistently along the PDS Heavy. The first piece to install is the head piece. With the door in the closed position, fasten the head piece so the rubber is in full contact with the slab with slight compression of the rubber. Repeat these steps with the two remaining leg pieces. Trim the bottom of each leg if necessary for a tight fit between the bottom of the PDS Heavy and the threshold or floor below. 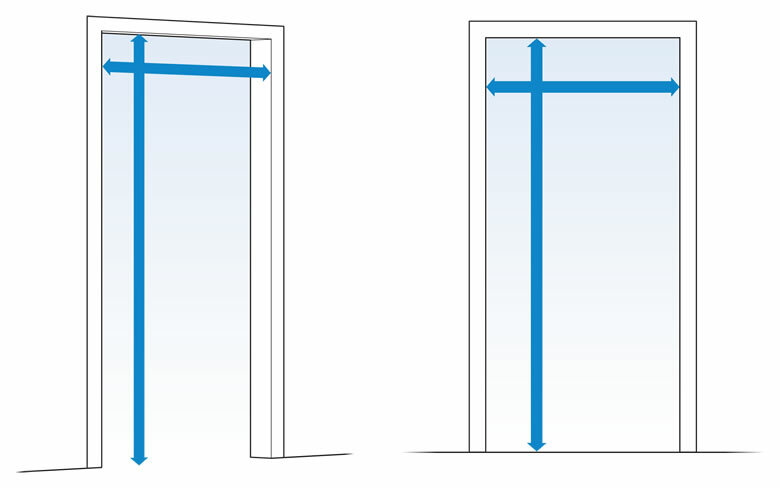 For the width, measure the distance between each vertical door jamb. This measurement is the width you should order for your PDS Heavy. For the height, measure the distance between the floor, or top of the threshold, and the top horizontal jamb. This measurement is the height you should order for your PDS Heavy. * Measure carefully. Custom cut components cannot be returned. All returnable door seal products require a 25% restock fee. Our independent sound tests have shown the PDS Heavy to perform as well as other comparable adjustable door stop sets. We have found in our own testing that the size of the perimeter door seal is not crucial. The important attributes are the ease of installation, quality of the foam or rubber in the seal, and the ability to have the seal come in full contact with the door along the entire perimeter door seal. In our sound tests, the only advantage we have found with the PDS Heavy over the PDS Light is about a 15% improvement in low frequencies.